This morning while driving along Bayfield Road (between Bayfield and Clinton) we spotted a single Bald Eagle flying in a south easterly direction. This is the first time that either my husband or I had seen one of these beautiful birds. We were surprised to see a Bald Eagle, but are happy to learn, from this site, that they have been seen in this area. Thank you so much for telling us about your Bald Eagle sighting - I'm sure our readers will be interested to know that they are in the Bayfield area. 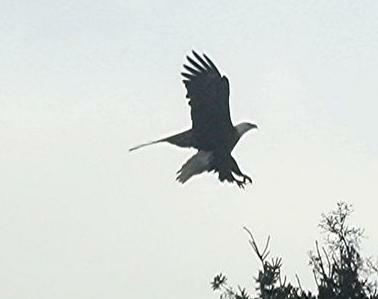 I found this picture of an Eagle in flight. My cousin and I were watching the sun set yesterday at a lake front cottage off of Sugar Bush Road when she spotted what she described as a "giant bird" in the tree. I got up to get a closer look and we could see that is was in fact an Eagle. It appeared to be pulling apart and eating some sort of rodent. We crept as close as we could snapping pictures with every step until the Eagle decided we were too close. It took flight along with its food giving us an even closer look as it flew by us making for some nice pictures. I have been coming to Bayfield every year for a very long time and this is the first time I have seen an Eagle, it was quite an experience! We spotted the Bald Eagle just south of Centennial Road on August 7th while walking along the beach - very impressive as it was very close - and just at tree top level! March 9th 2013, Bald Eagle sighting on the bank of Lake Huron near the Clinton highway 21 road.